A couple of years ago, I showed you the Slide portion of the CNY Reining Horse Association’s Ride and Slide competition at the NY State Fairground’s Coliseum arena. Thought I would show you the Ride part from this year’s show. That was also the time I had borrowed a friend’s Nikon D700 FX dSLR camera. Now, with my own, I think I improved on my results. Using the same Nikon 70-200mm f/2.8 VR lens as before. Have I said lately this is the best lens in the world? Thought so! Riders show their skill in doing a pattern at different fast gaits by first loping and then going at full gallup. The audience really got into it as the faster the rider went, the louder the cheers were. Riding a horse at full gallup in a pattern shows the judges a rider's control. Nikon D700/70-200VR, 1/400s, f/2.8, ISO 6400, EV 0, 200mm focal length. On Saturday night of the CNYRHA show, they have the Freestyle class. Each competitor does a three to five minute routine performed to music. Costuming of the rider and horse is allowed and adds to the fun. Like this “bride” performing a turnaround move which are fast 360 degree spins around a horse’s stationary hind leg. “She” came in first in the Pro division. 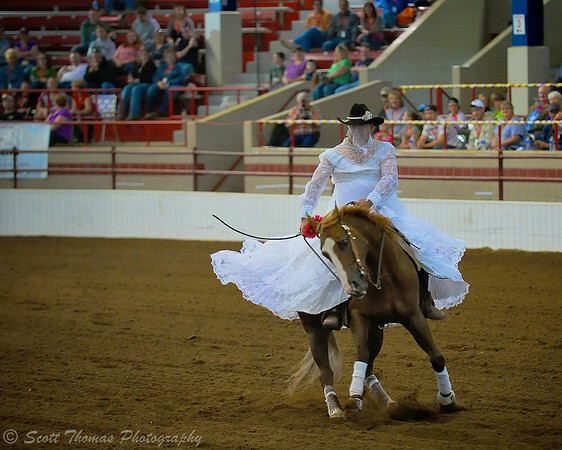 A "bride" performs a spin during the Freestyle class at the 2011 CNYRHA Reining Horse Ride and Slide show in Syracuse, New York. Nikon D700/70-200VR, 1/500s, f/2.8, ISO 4500, EV +0.3, 140mm focal length. Still, the most exciting and crowd pleasing part of reining horse shows are the slides. With dirt flying and the horse’s forelegs getting ready to dig in, this rider got a long and successful slide in during their class. Something the judges are looking for. Dirt flying and forelegs extended is a good sign of a successful slide by rider and horse during the CNYRHA Ride and Slide show in Syracuse, New York. Nikon D700/70-200VR, 1/400s, f/2.8, ISO 6400, EV 0, 200mm focal length. 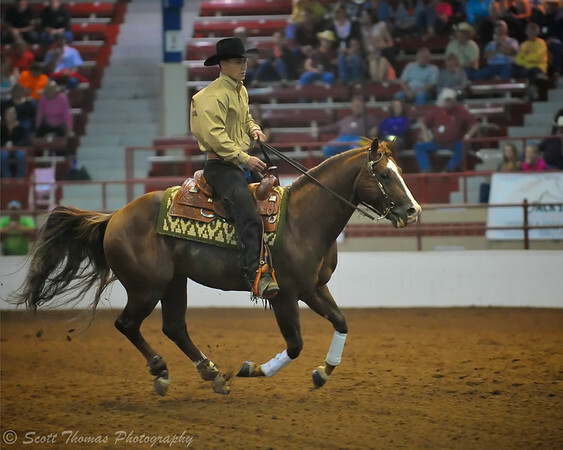 If you can attend a reining horse event, be prepared to see both horse and human atheletes compete as a team in fast and entertaining events. I can only imagine the time it must take to build up the trust of an animal to perform at such a high level. 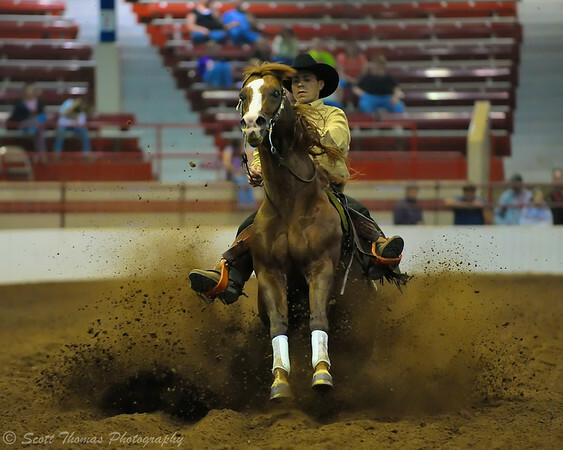 This entry was posted in Sports and tagged 70-200mm, arena, boots, cnyrha, coliseum, competition, cowboy, fairgrounds, gallup, hat, horse, lope, new york, nikon D700, reining, rider, show, slide, spins, vr, western. Bookmark the permalink. You should have seen the bridesmaids! LOL Thanks! Those are great action shots! It’s incredible what coordination is developed between horse and rider! Knowing how much time my daughter spent for classes with simple gaits and positioning, I can imagine how much more time it must take to learn to do this safely. While the, ahem. ‘bride’ is hilarious, the third shot is the winner! Such power and control and trust bewteen horse and rider. Horses really show their conditioning when doing these events. A couple of riders lost their hats. It was a rare event however. Two real American cowboys – and – surprise – a cowboy-bride. LOL – I like this fun (which they never did in those many cowboy-movies I was watching in my younger days…!). The last photo with the slide is great with the dirt flying around! Wow! That last shot is awesome! And gotta love that ‘bride.’ lol! Thanks, Robin! I was able to get right down to the edge of the ring for that one. I really liked the straight on angle. The bride was the hit of the night!